Police released photos of the Manchester bomber today. They also asked the public for aid in the situation. The photos were taken on CCTV and show the terrorist going to the arena where the horrendous act was committed. 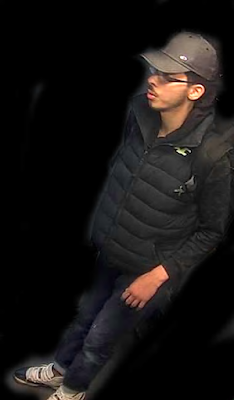 The man has been identified as 22 years old, Salman Abedi, just before his suicide attack on Ariana Grande’s concert in Manchester Arena earlier this week. The footage shows him wearing glasses, jeans, baseball cap, a puffa jacket, and of course the bag of which he used to kill innocent people that had attended the concert. It is believed by police that he assembled his bomb in a rented Airbnb flat, in a mansion block on Granby Row in the city center. The flat is just one of 17 places that have been searched so far by forensic experts. There are at least 14 other searches that have happened on Saturday. What detectives are sure about is that Abedi returned from Libya to the UK on May 18, just four days before his terrible attack on the concert attendees. They also hope that the images will jog the memories of the people who saw him run up to the attack. On Saturday night the threat level was reduced from critical to severe. The Greater Manchester Police Chief, as well as deputy assistant commissioner, said that the investigation was making good progress. 13 total people have so far been arrested for suspicion of terrorism offenses. There is also at least 1000 people involved in the investigation to Abedi’s network. It must be noted that the latest of arrests took place in Cheetham Hill, where police raids were taking place. Two men aged 20, 22 were taken into custody and are said to be part of the same friendship groups as the Manchester bomber. The two men are also of Libyan decent. Just after those arrests were made armed officers arrived at a terraced house in Manchester City’s Old Main Road Ground. Some residents were evacuated as military bomb disposal experts carried out their investigations to the property. GMP has set up a special counter-terrorism room in which they have a high priority of getting the identity of the attacker. “Specialist counter-terrorist forensic teams were sent to try and identify the attacker and within two hours his identity was known. With this information, officers could begin to establish his movements to try and understand if anyone else was linked or any more attacks planned,” a statement said. There was also firearms officers posted all over the country to aid GMP in the case of another attack as it was believed to be an imminent threat. “By early Tuesday morning there was an established pattern, with all officers and staff working on the response to the attack in the day and night shifts of approximately 14 hours each,” senior officers mentioned.